Straight shank drills are the most common drill type used in portable as well as fixed drilling applications. Somta manufactures various types of straight shank drills with differing flute geometries to suit specific applications. Drills are available in stub, jobber, long series and extra length versions. Drill material types are HSS, HSS-Co5 and Solid carbide. MTS drills are generally used in fixed drilling applications. Somta manufactures various types of MTS drills with differing flute geometries to suit specific applications. Drills are available in standard and extra length versions. Drill material types are HSS, HSS-Co5 and HSS-Co8. Sockets and sleeves are used for accommodating a MTS tool that has a different shank size to that of the machine arbor. Reamers are used for finishing a pre-drilled hole to a diameter that conforms to a closer tolerance than the drilled hole diameter. The reamed hole will have a superior surface finish and a closer diameter tolerance than that of a drilled hole. Reamers are used to produce holes which require a specific fit with a mating part. Countersinks are used for producing a chamfer on drilled or reamed hole, usually to accommodate a countersunk head screw. 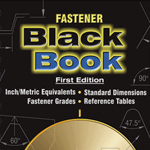 Counterbores are used for counter-boring a drilled or reamed hole to accommodate a bolt head. Countersinks and Counterbores are available with either a straight shank or a MTS. The term “shank cutters” is used to loosely refer to a range of tools that have threaded, plain or flatted shank. 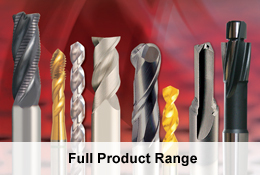 These tools are generally used in milling applications on vertical milling machines. Shank Cutters are available in regular and long series. Shank Cutter material types are HSS, HSS-Co5, HSS-Co8, HSS-Co8e and Solid Carbide. These cutters are generally used in milling applications on horizontal milling machines. These tools are used to produce internal threads (taps) and external threads (dies). Short Hand Taps are for use in hand tapping applications using a tap wrench. All short hand taps have straight flutes. Short Machine taps are for use in machine tapping applications. Helical flute machine taps are designed for use in blind hole tapping applications. The spiral flute of the tap is designed to direct the swarf up out of the tapped hole thereby preventing swarf buildup in the tapped hole. Gun Nose (spiral point) machine taps are designed for through hole tapping applications. The gun nose (spiral point) is designed to direct the swarf ahead of the tap in the hole thereby preventing swarf buildup in the tapped hole. Toolbits are manufactured for use in turning applications where the user can grind the required profile onto the tool bit. Ceratizit is the world market leader in selected industry sectors for unique and consistently innovative hard material products and Somta has been awarded sole distribution partnership in South Africa for the Ceratizit Product Range. 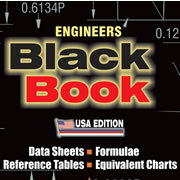 The ENGINEERS BLACK BOOK is a Technical Engineering Resource Book consolidating the most commonly used Engineering information into a easy-to-read and convenient user friendly format and Somta has been awarded sole distribution partnership in South Africa for the Engineers Black Book.